The ASM Mozambique Team braved terrible road conditions and unseasonably rainy weather in order to distribute nearly 500 audio Bibles in early July. Their ten-day-long journey led them to nine different locations throughout rural Mozambique. During one particularly wet audio Bible distribution, three men arrived—soaking wet—on their bicycles. 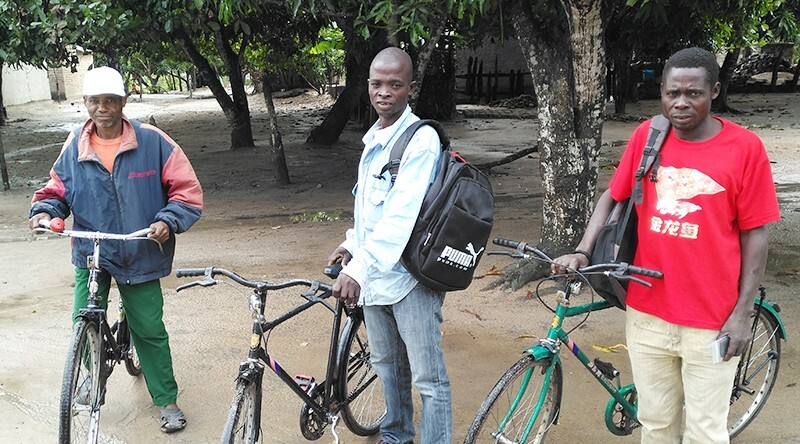 These men rode their bicycles over 15 miles through the rain for a chance to receive an audio Bible. One of these men stood up during the distribution to give a testimony. He shared how only weeks earlier he had entered a church for the first time and was baptized. He was so thankful. Because he could not read, he never imagined he would be able to have his own Bible. After receiving an audio Bible with gratitude, he could not wait to get home and share the Word with his wife, family, and neighbors.